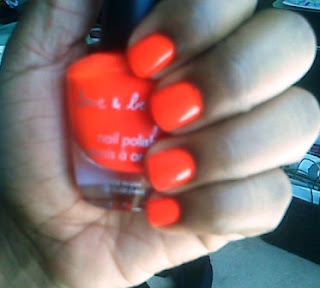 I'm a nail polish junkie and I couldn't pass up on this fun shade as I was heading out of Forever21. I've never given their polishes a second look, but at $2.80/bottle how could I not buy it. This neon burnt orange is the best way to add some life to the the overcast days AZ is experiencing (monsoon season). Yes, it's VERY bright... but if you aren't afraid of some color then I'd say go for it. Application: Be warned that the cheap price reflects the thick consistency. It took a steady hand and some patience to apply this polish as it can goo gop up pretty quickly. I used my Essie Good to Go top coat (the best top coat in my opinion) so I'm sure this cheap polish will last a few days.